Mega Construx American Girl Series 1 Blue Ribbon Mini Figure, $1.60 (Amazon Add-On Item) 4.8 out of 5 stars over 8 customer reviews. Mega Construx American Girl Series 1 Happy Hearts Mini Figure, $1.78 (Amazon Add-On Item) 4.2 out of 5 stars over 7 customer reviews. Mega Construx American Girl Series 1 Purple Passion Mini Figure, $2.44 (Amazon Add-On Item) 5.0 out of 5 stars over 4 customer reviews. Mega Construx American Girl Series 1 Lovely Sweater Mini Figure, $2.47 (Amazon Add-On Item) 4.7 out of 5 stars over 7 customer reviews. Mega Construx American Girl Series 1 Sunny Stripes Mini Figure, $2.47 (Amazon Add-On Item) 3.8 out of 5 stars over 8 customer reviews. Mega Construx American Girl Series 1 -Blue Shirt & Purple Skirt Collectible Figure, $2.69 (Amazon Add-On Item) 3.6 out of 5 stars over 7 customer reviews. Mega Construx American Girl Flower Power Figure, $2.90 (Amazon Add-On Item) No reviews yet. Mega Construx WellieWishers Willa Mini Figure, $2.99 (Amazon Add-On Item) No reviews yet. Mega Construx American Girl Series 1 Furever Friends Mini Figure, $3.07 (Amazon Add-On Item) 4.4 out of 5 stars over 3 customer reviews. Mega Construx American Girl Collectible Blue Confetti Figure, $3.48 (Amazon Add-On Item) No reviews yet. 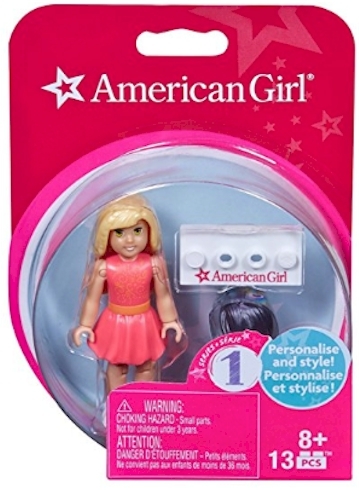 Combine with Mega Bloks American Girl play sets to build your own stories!